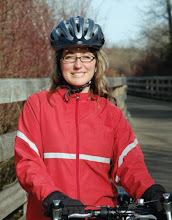 Lana Popham's 2009 Campaign: Cycling! Love it! 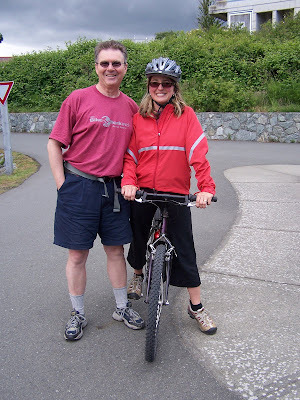 This was the first year I participated in Bike To Work Week Victoria. I was a bit hesitant because I live in rural Saanich and the ride into town takes about 50 minutes. I had been a cyclist in Vancouver in the early 90's and enjoyed it back then but hadn't made it a part of my life since moving to Victoria. Bike To Work Week gave me the push I needed to reconnect with how great cycling really is. I have been using an older mountain bike and this has worked for me very well because I have been sticking to the trails...out of fear of traffic. I needed to get my confidence and skill level up and this has happened over a 3 month period. This month I have graduated to a cyclecross bike and have started to find my way along main roads and highways. This has been an eyeopener to what is needed as far as infrastructure goes. I have to say that the trail system is awesome but lacks signage. There have been many occasions where I am unsure which diection to take after exiting certain trails. I have also found that bike lanes working along side vehicle traffic are essential. Nothing is worse than a bike lane ending and throwing you out into fast moving traffic. Challenging for the cyclist and challenging for the vehicle operators. Many transitions I make in these cases feels like an accident waiting to happen. So how do I feel about spending money on non-fuel powered transportation infrastructure? This includes walking and biking......I say we need to spend the money to make it work. It is imperative to our sustainable vision and it makes sense. I am grateful to Bike To Work Week.....it gave me a push I needed to rediscover cycling for commuting.....I think I am addicted!